1 G None No Power Seat 1 G is a standard Business Class Bulkhead seat. There is no floor storage for this seat during take-off and landing. 31 A None No Power Seat 31 A is an Economy Class Bulkhead seat that may have restricted legroom due to the position of the Bulkhead. The tray table is in the armrest, making the armrest immovable and slightly reducing seat width. There is no floor storage for this seat during take-off and landing. 31 B None No Power Seat 31 B is an Economy Class Bulkhead seat that may have restricted legroom due to the position of the Bulkhead. The tray table is in the armrest, making the armrest immovable and slightly reducing seat width. There is no floor storage for this seat during take-off and landing. 31 C None No Power Seat 31 C is an Economy Class Bulkhead seat that may have restricted legroom due to the position of the Bulkhead. The tray table is in the armrest, making the armrest immovable and slightly reducing seat width. There is no floor storage for this seat during take-off and landing. 31 D None No Power Seat 31 D is an Economy Class Bulkhead seat that may have restricted legroom due to the position of the Bulkhead. The tray table is in the armrest, making the armrest immovable and slightly reducing seat width. There is no floor storage for this seat during take-off and landing. 31 E None No Power Seat 31 E is an Economy Class Bulkhead seat that may have restricted legroom due to the position of the Bulkhead. The tray table is in the armrest, making the armrest immovable and slightly reducing seat width. There is no floor storage for this seat during take-off and landing. 31 F None No Power Seat 31 F is an Economy Class Bulkhead seat that may have restricted legroom due to the position of the Bulkhead. The tray table is in the armrest, making the armrest immovable and slightly reducing seat width. There is no floor storage for this seat during take-off and landing. 31 G None No Power Seat 31 G is an Economy Class Bulkhead seat that may have restricted legroom due to the position of the Bulkhead. The tray table is in the armrest, making the armrest immovable and slightly reducing seat width. There is no floor storage for this seat during take-off and landing. 31 H None No Power Seat 31 H is an Economy Class Bulkhead seat that may have restricted legroom due to the position of the Bulkhead. The tray table is in the armrest, making the armrest immovable and slightly reducing seat width. There is no floor storage for this seat during take-off and landing. 31 J None No Power Seat 31 J is an Economy Class Bulkhead seat that may have restricted legroom due to the position of the Bulkhead. The tray table is in the armrest, making the armrest immovable and slightly reducing seat width. There is no floor storage for this seat during take-off and landing. 31 K None No Power Seat 31 K is an Economy Class Bulkhead seat that may have restricted legroom due to the position of the Bulkhead. The tray table is in the armrest, making the armrest immovable and slightly reducing seat width. There is no floor storage for this seat during take-off and landing. 32 C None No Power Seat 32 C is standard Economy Class seat. 32 H None No Power Seat 32 H is standard Economy Class seat. 33 A None No Power Seat 33 A is standard Economy Class seat that is missing a window. 33 C None No Power Seat 33 C is standard Economy Class seat. 33 H None No Power Seat 33 H is standard Economy Class seat. 33 K None No Power Seat 33 K is standard Economy Class seat that is missing a window. 34 C None No Power Seat 34 C is standard Economy Class seat. 34 H None No Power Seat 34 H is standard Economy Class seat. 35 C None No Power Seat 35 C is standard Economy Class seat. 35 H None No Power Seat 35 H is standard Economy Class seat. 36 A None No Power Seat 36 A is standard Economy Class seat that is missing a window. 36 C None No Power Seat 36 C is standard Economy Class seat. 36 D None No Power Seat 36 D is standard Economy Class seat. 36 E None No Power Seat 36 E is standard Economy Class seat. 36 G None No Power Seat 36 G is standard Economy Class seat. 36 H None No Power Seat 36 H is standard Economy Class seat. 36 K None No Power Seat 36 K is standard Economy Class seat that is missing a window. 37 C None No Power Seat 37 C is standard Economy Class seat. 37 G None No Power Seat 37 G is standard Economy Class seat. 37 H None No Power Seat 37 H is standard Economy Class seat. 38 A None No Power Seat 38 A is an Economy Class seat that may have limited recline. The close proximity to the lavatories may be bothersome. 38 B None No Power Seat 38 B is an Economy Class seat that may have limited recline. The close proximity to the lavatories may be bothersome. 38 C None No Power Seat 38 C is an Economy Class seat that may have limited recline. The close proximity to the lavatories may be bothersome. 38 D None No Power Seat 38 D is an Economy Class seat where the close proximity to the lavatories may be bothersome. 38 G None No Power Seat 38 G is an Economy Class seat where the close proximity to the lavatories may be bothersome. 38 H None No Power Seat 38 H is an Economy Class seat that may have limited recline. The close proximity to the lavatories may be bothersome. 38 J None No Power Seat 38 J is an Economy Class seat that may have limited recline. The close proximity to the lavatories may be bothersome. 38 K None No Power Seat 38 K is an Economy Class seat that may have limited recline. The close proximity to the lavatories may be bothersome. 39 D None No Power Seat 39 D is an Economy Class seat that may have limited recline. The close proximity to the lavatories may be bothersome. 39 E None No Power Seat 39 E is an Economy Class seat that may have limited recline. The close proximity to the lavatories may be bothersome. 39 F None No Power Seat 39 F is an Economy Class seat that may have limited recline. The close proximity to the lavatories may be bothersome. 39 G None No Power Seat 39 G is an Economy Class seat that may have limited recline. The close proximity to the lavatories may be bothersome. 4 A None No Power Seat 4 A is a Business Class seat whose close proximity to the galleys and lavatories may be bothersome. 4 C None No Power Seat 4 C is a Business Class seat whose close proximity to the galleys and lavatories may be bothersome. 4 D None No Power Seat 4 D is a Business Class seat whose close proximity to the galleys and lavatories may be bothersome. 4 E None No Power Seat 4 E is a Business Class seat whose close proximity to the galleys and lavatories may be bothersome. 4 G None No Power Seat 4 G is a Business Class seat whose close proximity to the galleys and lavatories may be bothersome. 4 H None No Power Seat 4 H is a Business Class seat whose close proximity to the galleys and lavatories may be bothersome. 4 K None No Power Seat 4 K is a Business Class seat whose close proximity to the galleys and lavatories may be bothersome. 41 A None No Power Seat 41 A is an Economy Class Exit Row seat with extra legroom. However, the close proximity to the lavatories may be bothersome. The tray table is in the armrest, making the armrest immovable and slightly reducing seat width. There is no floor storage for this seat during take-off and landing. 41 B None No Power Seat 41 B is an Economy Class Exit Row seat with extra legroom. However, the close proximity to the lavatories may be bothersome. The tray table is in the armrest, making the armrest immovable and slightly reducing seat width. There is no floor storage for this seat during take-off and landing. 41 C None No Power Seat 41 C is an Economy Class Exit Row seat with extra legroom. However, the close proximity to the lavatories may be bothersome. The tray table is in the armrest, making the armrest immovable and slightly reducing seat width. There is no floor storage for this seat during take-off and landing. Other flyers tend to bump into this seat. 41 D None No Power Seat 41 D is an Economy Class Exit Row seat with extra legroom. However, the close proximity to the lavatories may be bothersome. The tray table is in the armrest, making the armrest immovable and slightly reducing seat width. There is no floor storage for this seat during take-off and landing. 41 E None No Power Seat 41 E is an Economy Class Exit Row seat with extra legroom. However, the close proximity to the lavatories may be bothersome. The tray table is in the armrest, making the armrest immovable and slightly reducing seat width. There is no floor storage for this seat during take-off and landing. 41 F None No Power Seat 41 F is an Economy Class Exit Row seat with extra legroom. However, the close proximity to the lavatories may be bothersome. The tray table is in the armrest, making the armrest immovable and slightly reducing seat width. There is no floor storage for this seat during take-off and landing. 41 G None No Power Seat 41 G is an Economy Class Exit Row seat with extra legroom. However, the close proximity to the lavatories may be bothersome. The tray table is in the armrest, making the armrest immovable and slightly reducing seat width. There is no floor storage for this seat during take-off and landing. 41 H None No Power Seat 41 H is an Economy Class Exit Row seat with extra legroom. However, the close proximity to the lavatories may be bothersome. The tray table is in the armrest, making the armrest immovable and slightly reducing seat width. There is no floor storage for this seat during take-off and landing. Other flyers tend to bump into this seat. 41 J None No Power Seat 41 J is an Economy Class Exit Row seat with extra legroom. However, the close proximity to the lavatories may be bothersome. The tray table is in the armrest, making the armrest immovable and slightly reducing seat width. There is no floor storage for this seat during take-off and landing. 41 K None No Power Seat 41 K is an Economy Class Exit Row seat with extra legroom. However, the close proximity to the lavatories may be bothersome. The tray table is in the armrest, making the armrest immovable and slightly reducing seat width. There is no floor storage for this seat during take-off and landing. 42 A None No Power Seat 42 A is standard Economy Class seat. 42 B None No Power Seat 42 B is standard Economy Class seat. 42 C None No Power Seat 42 C is standard Economy Class seat. 42 D None No Power Seat 42 D is standard Economy Class seat. 42 E None No Power Seat 42 E is standard Economy Class seat. 42 F None No Power Seat 42 F is standard Economy Class seat. 42 G None No Power Seat 42 G is standard Economy Class seat. 42 H None No Power Seat 42 H is standard Economy Class seat. 42 J None No Power Seat 42 J is standard Economy Class seat. 42 K None No Power Seat 42 K is standard Economy Class seat. 43 A None No Power Seat 43 A is standard Economy Class seat. 43 B None No Power Seat 43 B is standard Economy Class seat. 43 C None No Power Seat 43 C is standard Economy Class seat. 43 D None No Power Seat 43 D is standard Economy Class seat. 43 E None No Power Seat 43 E is standard Economy Class seat. 43 F None No Power Seat 43 F is standard Economy Class seat. 43 G None No Power Seat 43 G is standard Economy Class seat. 43 H None No Power Seat 43 H is standard Economy Class seat. 43 J None No Power Seat 43 J is standard Economy Class seat. 43 K None No Power Seat 43 K is standard Economy Class seat. 44 A None No Power Seat 44 A is standard Economy Class seat. 44 B None No Power Seat 44 B is standard Economy Class seat. 44 C None No Power Seat 44 C is standard Economy Class seat. 44 D None No Power Seat 44 D is standard Economy Class seat. 44 E None No Power Seat 44 E is standard Economy Class seat. 44 F None No Power Seat 44 F is standard Economy Class seat. 44 G None No Power Seat 44 G is standard Economy Class seat. 44 H None No Power Seat 44 H is standard Economy Class seat. 44 J None No Power Seat 44 J is standard Economy Class seat. 44 K None No Power Seat 44 K is standard Economy Class seat. 45 A None No Power Seat 45 A is standard Economy Class seat. 45 B None No Power Seat 45 B is standard Economy Class seat. 45 C None No Power Seat 45 C is standard Economy Class seat. 45 D None No Power Seat 45 D is standard Economy Class seat. 45 E None No Power Seat 45 E is standard Economy Class seat. 45 F None No Power Seat 45 F is standard Economy Class seat. 45 G None No Power Seat 45 G is standard Economy Class seat. 45 H None No Power Seat 45 H is standard Economy Class seat. 45 J None No Power Seat 45 J is standard Economy Class seat. 45 K None No Power Seat 45 K is standard Economy Class seat. 46 A None No Power Seat 46 A is standard Economy Class seat. 46 B None No Power Seat 46 B is standard Economy Class seat. 46 C None No Power Seat 46 C is standard Economy Class seat. 46 D None No Power Seat 46 D is standard Economy Class seat. 46 E None No Power Seat 46 E is standard Economy Class seat. 46 F None No Power Seat 46 F is standard Economy Class seat. 46 G None No Power Seat 46 G is standard Economy Class seat. 46 H None No Power Seat 46 H is standard Economy Class seat. 46 J None No Power Seat 46 J is standard Economy Class seat. 46 K None No Power Seat 46 K is standard Economy Class seat. 47 A None No Power Seat 47 A is standard Economy Class seat. 47 B None No Power Seat 47 B is standard Economy Class seat. 47 C None No Power Seat 47 C is standard Economy Class seat. 47 D None No Power Seat 47 D is standard Economy Class seat. 47 E None No Power Seat 47 E is standard Economy Class seat. 47 F None No Power Seat 47 F is standard Economy Class seat. 47 G None No Power Seat 47 G is standard Economy Class seat. 47 H None No Power Seat 47 H is standard Economy Class seat. 47 J None No Power Seat 47 J is standard Economy Class seat. 47 K None No Power Seat 47 K is standard Economy Class seat. 48 A None No Power Seat 48 A is standard Economy Class seat. 48 B None No Power Seat 48 B is standard Economy Class seat. 48 C None No Power Seat 48 C is standard Economy Class seat. 48 D None No Power Seat 48 D is standard Economy Class seat. 48 E None No Power Seat 48 E is standard Economy Class seat. 48 F None No Power Seat 48 F is standard Economy Class seat. 48 G None No Power Seat 48 G is standard Economy Class seat. 48 H None No Power Seat 48 H is standard Economy Class seat. 48 J None No Power Seat 48 J is standard Economy Class seat. 48 K None No Power Seat 48 K is standard Economy Class seat. 49 A None No Power Seat 49 A is standard Economy Class seat. 49 B None No Power Seat 49 B is standard Economy Class seat. 49 C None No Power Seat 49 C is standard Economy Class seat. 49 D None No Power Seat 49 D is standard Economy Class seat. 49 E None No Power Seat 49 E is standard Economy Class seat. 49 F None No Power Seat 49 F is standard Economy Class seat. 49 G None No Power Seat 49 G is standard Economy Class seat. 49 H None No Power Seat 49 H is standard Economy Class seat. 49 J None No Power Seat 49 J is standard Economy Class seat. 49 K None No Power Seat 49 K is standard Economy Class seat. 5 A None No Power Seat 5 A is a Business Class seat whose close proximity to the galleys and lavatories may be bothersome. 5 C None No Power Seat 5 C is a Business Class seat whose close proximity to the galleys and lavatories may be bothersome. 5 D None No Power Seat 5 D is a Business Class seat whose close proximity to the galleys and lavatories may be bothersome. 5 E None No Power Seat 5 E is a Business Class seat whose close proximity to the galleys and lavatories may be bothersome. 5 G None No Power Seat 5 G is a Business Class seat whose close proximity to the galleys and lavatories may be bothersome. 5 H None No Power Seat 5 H is a Business Class seat whose close proximity to the galleys and lavatories may be bothersome. 5 K None No Power Seat 5 K is a Business Class seat whose close proximity to the galleys and lavatories may be bothersome. 50 A None No Power Seat 50 A is standard Economy Class seat. 50 B None No Power Seat 50 B is standard Economy Class seat. 50 C None No Power Seat 50 C is standard Economy Class seat. 50 D None No Power Seat 50 D is standard Economy Class seat. 50 E None No Power Seat 50 E is standard Economy Class seat. 50 F None No Power Seat 50 F is standard Economy Class seat. 50 G None No Power Seat 50 G is standard Economy Class seat. 50 H None No Power Seat 50 H is standard Economy Class seat. 50 J None No Power Seat 50 J is standard Economy Class seat. 50 K None No Power Seat 50 K is standard Economy Class seat. 51 A None No Power Seat 51 A is standard Economy Class seat. 51 B None No Power Seat 51 B is standard Economy Class seat. 51 C None No Power Seat 51 C is standard Economy Class seat. 51 D None No Power Seat 51 D is standard Economy Class seat. 51 E None No Power Seat 51 E is standard Economy Class seat. 51 F None No Power Seat 51 F is standard Economy Class seat. 51 G None No Power Seat 51 G is standard Economy Class seat. 51 H None No Power Seat 51 H is standard Economy Class seat. 51 J None No Power Seat 51 J is standard Economy Class seat. 51 K None No Power Seat 51 K is standard Economy Class seat. 52 A None No Power Seat 52 A is standard Economy Class seat. 52 B None No Power Seat 52 B is standard Economy Class seat. 52 C None No Power Seat 52 C is standard Economy Class seat. 52 D None No Power Seat 52 D is standard Economy Class seat. 52 E None No Power Seat 52 E is standard Economy Class seat. 52 F None No Power Seat 52 F is standard Economy Class seat. 52 G None No Power Seat 52 G is standard Economy Class seat. 52 H None No Power Seat 52 H is standard Economy Class seat. 52 J None No Power Seat 52 J is standard Economy Class seat. 52 K None No Power Seat 52 K is standard Economy Class seat. 53 A None No Power Seat 53 A is an Economy Class seat that may have limited recline. The close proximity to the lavatories and galleys may be bothersome. 53 C None No Power Seat 53 C is an Economy Class seat that may have limited recline. The close proximity to the lavatories and galleys may be bothersome. 53 D None No Power Seat 53 D is standard Economy Class seat. 53 E None No Power Seat 53 E is standard Economy Class seat. 53 F None No Power Seat 53 F is standard Economy Class seat. 53 G None No Power Seat 53 G is standard Economy Class seat. 53 H None No Power Seat 53 H is an Economy Class seat that may have limited recline. The close proximity to the lavatories and galleys may be bothersome. 53 K None No Power Seat 53 K is an Economy Class seat that may have limited recline. The close proximity to the lavatories and galleys may be bothersome. 54 D None No Power Seat 54 D is an Economy Class seat that may have limited recline. The close proximity to the lavatories and galleys may be bothersome. 54 E None No Power Seat 54 E is an Economy Class seat that may have limited recline. The close proximity to the lavatories and galleys may be bothersome. 54 F None No Power Seat 54 F is an Economy Class seat that may have limited recline. The close proximity to the lavatories and galleys may be bothersome. 54 G None No Power Seat 54 G is an Economy Class seat that may have limited recline. The close proximity to the lavatories and galleys may be bothersome. 61 A None No Power Seat 61 A is an Economy Class Bulkhead seat with extra legroom. However, the close proximity to the lavatories and galleys may be bothersome. The tray table is in the armrest, making the armrest immovable and slightly reducing seat width. There is no floor storage for this seat during take-off and landing. 61 B None No Power Seat 61 B is an Economy Class Bulkhead seat with extra legroom. However, the close proximity to the lavatories and galleys may be bothersome. The tray table is in the armrest, making the armrest immovable and slightly reducing seat width. There is no floor storage for this seat during take-off and landing. 61 C None No Power Seat 61 C is an Economy Class Bulkhead seat with extra legroom. However, the close proximity to the lavatories and galleys may be bothersome. The tray table is in the armrest, making the armrest immovable and slightly reducing seat width. There is no floor storage for this seat during take-off and landing. Other flyers tend to bump into this seat. 61 D None No Power Seat 61 D is an Economy Class Bulkhead seat with extra legroom. However, the close proximity to the lavatories and galleys may be bothersome. The tray table is in the armrest, making the armrest immovable and slightly reducing seat width. There is no floor storage for this seat during take-off and landing. 61 E None No Power Seat 61 E is an Economy Class Bulkhead seat with extra legroom. However, the close proximity to the lavatories and galleys may be bothersome. The tray table is in the armrest, making the armrest immovable and slightly reducing seat width. There is no floor storage for this seat during take-off and landing. 61 F None No Power Seat 61 F is an Economy Class Bulkhead seat with extra legroom. However, the close proximity to the lavatories and galleys may be bothersome. The tray table is in the armrest, making the armrest immovable and slightly reducing seat width. There is no floor storage for this seat during take-off and landing. 61 G None No Power Seat 61 G is an Economy Class Bulkhead seat with extra legroom. However, the close proximity to the lavatories and galleys may be bothersome. The tray table is in the armrest, making the armrest immovable and slightly reducing seat width. There is no floor storage for this seat during take-off and landing. 61 H None No Power Seat 61 H is an Economy Class Bulkhead seat with extra legroom. However, the close proximity to the lavatories and galleys may be bothersome. The tray table is in the armrest, making the armrest immovable and slightly reducing seat width. There is no floor storage for this seat during take-off and landing. Other flyers tend to bump into this seat. 61 J None No Power Seat 61 J is an Economy Class Bulkhead seat with extra legroom. However, the close proximity to the lavatories and galleys may be bothersome. The tray table is in the armrest, making the armrest immovable and slightly reducing seat width. There is no floor storage for this seat during take-off and landing. 61 K None No Power Seat 61 K is an Economy Class Bulkhead seat with extra legroom. However, the close proximity to the lavatories and galleys may be bothersome. The tray table is in the armrest, making the armrest immovable and slightly reducing seat width. There is no floor storage for this seat during take-off and landing. 62 A None No Power Seat 62 A is standard Economy Class seat. 62 B None No Power Seat 62 B is standard Economy Class seat. 62 C None No Power Seat 62 C is standard Economy Class seat. 62 D None No Power Seat 62 D is standard Economy Class seat. 62 E None No Power Seat 62 E is standard Economy Class seat. 62 F None No Power Seat 62 F is standard Economy Class seat. 62 G None No Power Seat 62 G is standard Economy Class seat. 62 H None No Power Seat 62 H is standard Economy Class seat. 62 J None No Power Seat 62 J is standard Economy Class seat. 62 K None No Power Seat 62 K is standard Economy Class seat. 63 A None No Power Seat 63 A is standard Economy Class seat. 63 B None No Power Seat 63 B is standard Economy Class seat. 63 C None No Power Seat 63 C is standard Economy Class seat. 63 D None No Power Seat 63 D is standard Economy Class seat. 63 E None No Power Seat 63 E is standard Economy Class seat. 63 F None No Power Seat 63 F is standard Economy Class seat. 63 G None No Power Seat 63 G is standard Economy Class seat. 63 H None No Power Seat 63 H is standard Economy Class seat. 63 J None No Power Seat 63 J is standard Economy Class seat. 63 K None No Power Seat 63 K is standard Economy Class seat. 64 A None No Power Seat 64 A is standard Economy Class seat. 64 B None No Power Seat 64 B is standard Economy Class seat. 64 C None No Power Seat 64 C is standard Economy Class seat. 64 D None No Power Seat 64 D is standard Economy Class seat. 64 E None No Power Seat 64 E is standard Economy Class seat. 64 F None No Power Seat 64 F is standard Economy Class seat. 64 G None No Power Seat 64 G is standard Economy Class seat. 64 H None No Power Seat 64 H is standard Economy Class seat. 64 J None No Power Seat 64 J is standard Economy Class seat. 64 K None No Power Seat 64 K is standard Economy Class seat. 65 A None No Power Seat 65 A is standard Economy Class seat. 65 B None No Power Seat 65 B is standard Economy Class seat. 65 C None No Power Seat 65 C is standard Economy Class seat. 65 D None No Power Seat 65 D is standard Economy Class seat. 65 E None No Power Seat 65 E is standard Economy Class seat. 65 F None No Power Seat 65 F is standard Economy Class seat. 65 G None No Power Seat 65 G is standard Economy Class seat. 65 H None No Power Seat 65 H is standard Economy Class seat. 65 J None No Power Seat 65 J is standard Economy Class seat. 65 K None No Power Seat 65 K is standard Economy Class seat. 66 A None No Power Seat 66 A is standard Economy Class seat. 66 B None No Power Seat 66 B is standard Economy Class seat. 66 C None No Power Seat 66 C is standard Economy Class seat. 66 D None No Power Seat 66 D is standard Economy Class seat. 66 E None No Power Seat 66 E is standard Economy Class seat. 66 F None No Power Seat 66 F is standard Economy Class seat. 66 G None No Power Seat 66 G is standard Economy Class seat. 66 H None No Power Seat 66 H is standard Economy Class seat. 66 J None No Power Seat 66 J is standard Economy Class seat. 66 K None No Power Seat 66 K is standard Economy Class seat. 67 A None No Power Seat 67 A is standard Economy Class seat. 67 B None No Power Seat 67 B is standard Economy Class seat. 67 C None No Power Seat 67 C is standard Economy Class seat. 67 D None No Power Seat 67 D is standard Economy Class seat. 67 E None No Power Seat 67 E is standard Economy Class seat. 67 F None No Power Seat 67 F is standard Economy Class seat. 67 G None No Power Seat 67 G is standard Economy Class seat. 67 H None No Power Seat 67 H is standard Economy Class seat. 67 J None No Power Seat 67 J is standard Economy Class seat. 67 K None No Power Seat 67 K is standard Economy Class seat. 68 A None No Power Seat 68 A is standard Economy Class seat. 68 B None No Power Seat 68 B is standard Economy Class seat. 68 C None No Power Seat 68 C is an Economy Class seat that is often bumped into by passengers and crew members. 68 D None No Power Seat 68 D is standard Economy Class seat. 68 E None No Power Seat 68 E is standard Economy Class seat. 68 F None No Power Seat 68 F is standard Economy Class seat. 68 G None No Power Seat 68 G is standard Economy Class seat. 68 H None No Power Seat 68 H is an Economy Class seat that is often bumped into by passengers and crew members. 68 J None No Power Seat 68 J is standard Economy Class seat. 68 K None No Power Seat 68 K is standard Economy Class seat. 69 A None No Power Seat 69 A is an Economy Class seat that may have restricted legroom due to the misalignment with the seats ahead. 69 C None No Power Seat 69 C is an Economy Class seat that may have restricted legroom due to the misalignment with the seats ahead. 69 D None No Power Seat 69 D is standard Economy Class seat. 69 E None No Power Seat 69 E is standard Economy Class seat. 69 F None No Power Seat 69 F is standard Economy Class seat. 69 G None No Power Seat 69 G is standard Economy Class seat. 69 H None No Power Seat 69 H is an Economy Class seat that may have restricted legroom due to the misalignment with the seats ahead. 69 K None No Power Seat 69 K is an Economy Class seat that may have restricted legroom due to the misalignment with the seats ahead. 70 A None No Power Seat 70 A is standard Economy Class seat. 70 C None No Power Seat 70 C is standard Economy Class seat. 70 D None No Power Seat 70 D is standard Economy Class seat. 70 E None No Power Seat 70 E is standard Economy Class seat. 70 F None No Power Seat 70 F is standard Economy Class seat. 70 G None No Power Seat 70 G is standard Economy Class seat. 70 H None No Power Seat 70 H is standard Economy Class seat. 70 K None No Power Seat 70 K is standard Economy Class seat. 71 A None No Power Seat 71 A is an Economy Class seat where space may be restricted due to the curvature of the plane. The close proximity to the galleys and lavatories may be bothersome. 71 C None No Power Seat 71 C is an Economy Class seat where space may be restricted due to the curvature of the plane. The close proximity to the galleys and lavatories may be bothersome. 71 D None No Power Seat 71 D is an Economy Class seat where space may be restricted due to the curvature of the plane. The close proximity to the galleys and lavatories may be bothersome. 71 E None No Power Seat 71 E is an Economy Class seat where space may be restricted due to the curvature of the plane. The close proximity to the galleys and lavatories may be bothersome. 71 F None No Power Seat 71 F is an Economy Class seat where space may be restricted due to the curvature of the plane. The close proximity to the galleys and lavatories may be bothersome. 71 G None No Power Seat 71 G is an Economy Class seat where space may be restricted due to the curvature of the plane. The close proximity to the galleys and lavatories may be bothersome. 71 H None No Power Seat 71 H is an Economy Class seat where space may be restricted due to the curvature of the plane. The close proximity to the galleys and lavatories may be bothersome. 71 K None No Power Seat 71 K is an Economy Class seat where space may be restricted due to the curvature of the plane. The close proximity to the galleys and lavatories may be bothersome. 72 A None No Power Seat 72 A is an Economy Class seat in the last row of the plane that may not recline and where space may be restricted due to the curvature of the plane. The close proximity to the galleys and lavatories may be bothersome. 72 C None No Power Seat 72 C is an Economy Class seat in the last row of the plane that may not recline and where space may be restricted due to the curvature of the plane. The close proximity to the galleys and lavatories may be bothersome. 72 D None No Power Seat 72 D is an Economy Class seat in the last row of the plane that may not recline and where space may be restricted due to the curvature of the plane. The close proximity to the galleys and lavatories may be bothersome. 72 E None No Power Seat 72 E is an Economy Class seat in the last row of the plane that may not recline and where space may be restricted due to the curvature of the plane. The close proximity to the galleys and lavatories may be bothersome. 72 F None No Power Seat 72 F is an Economy Class seat in the last row of the plane that may not recline and where space may be restricted due to the curvature of the plane. The close proximity to the galleys and lavatories may be bothersome. 72 G None No Power Seat 72 G is an Economy Class seat in the last row of the plane that may not recline and where space may be restricted due to the curvature of the plane. The close proximity to the galleys and lavatories may be bothersome. 72 H None No Power Seat 72 H is an Economy Class seat in the last row of the plane that may not recline and where space may be restricted due to the curvature of the plane. The close proximity to the galleys and lavatories may be bothersome. 72 K None No Power Seat 72 K is an Economy Class seat in the last row of the plane that may not recline and where space may be restricted due to the curvature of the plane. The close proximity to the galleys and lavatories may be bothersome. All seats are equipped with Panasonic eX2 Inflight Entertainment Systems, featuring AVOD (Audio Video OnDemand). There is a wide variety of audio, video, and gaming options to chose from. Each seat in Business Class is outfitted with a 15.4" seat-back mounted screen and a 10.6" screen in the armrest. Economy Class seats have 9" seat-back mounted screens. AC power is available in Business Class only. Philippine Airlines flies the Boeing 777-300ER with 370 seats in a two-class configuration of Business and Economy. 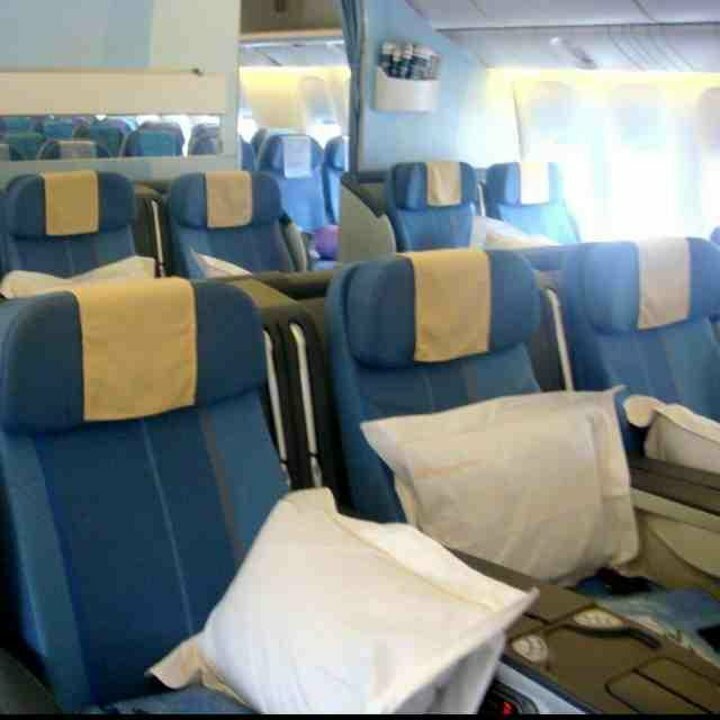 Mabuhay is Philippine's Business Class product and Fiesta is its Economy Class product. This aircraft is used primarily on flights to and from Australia. 38A, 38B and 38C all have fine legroom and recline. 38A has a little extra room to move around in without bothering anyone behind you. But beware, this row does not have an overhead bin. The smaller bin for this row is reserved for children lifevests. So you'll have to squeeze into another nearby bin. And on inbound (to Manila) Philippine Airlines flights, space in the overhead bin will always be at a premium as most passengers will have carry on luggage. No Air Vents above, I think all of PAL's aircaft do not have these vents, crazy in a hot country !!! Be warned that even though the airline's seat map may show empty economy seats for you to stretch out in, these may be filled up with cruise ship workers. Basically any remaining empty seats are filled, so we were shocked that what we though would be an almost empty rear of the plane was actually full. So pick your seats assuming the worst. For bulkhead seats, row 41 has much more room than 61, enough that you could lie down in front of the seats. The 2-across in row 53 seemed like a good choice as well if traveling with a partner. All economy seats on this plane seem to recline by sliding forward, so don't worry about seat backs coming into your space. The seat actually depends on what aircraft you fly on. If you get to fly the new B777 then you're lucky because they've got full flat beds with new seat features. For me the aircraft that I flew on was the RP-C7773, which has the old cabin. The seats we're okay and it offers a great legroom. The only disadvantage for me is that you don't really have the space to put some personal things. But the service was 10/10. 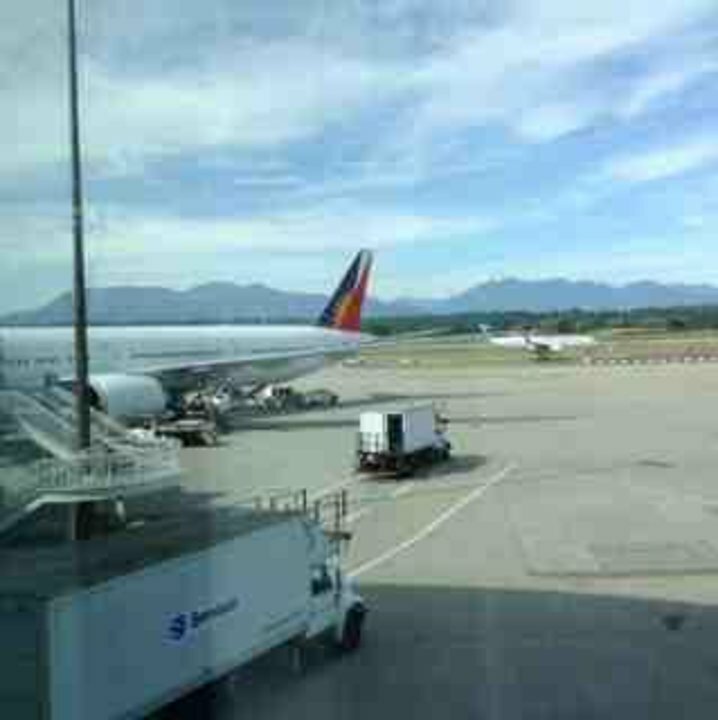 I was in "window" seat 36k on this flight from Manila-to-SF on a 777-300er last week. IT HAS NO WINDOW (all plastic). Of course the same applies for seat 36A. So please make a note of this lack of window on the seat map. The seat should be yellow. Travelling with me are my husband and 1 year-old son. My son loves to keep moving while he is still awake and so I choose this seats so we cannot disturb another passenger if incase we want to keep standing. The table tray and screen are not aligned to the seat which is a little minor issue. The arm rest between seats 69A & 69C can't be pulled up. A little untidy on the floor of the plane but overall the crew were all great! I booked online and the seat I thought I choose was up a row and I thought it might be to close to the galley. However it turned out to be no problem and I was able to sleep well in it. Lots of legroom and you need to reach to touch the screen if you handheld was not working. Good choice of AV. 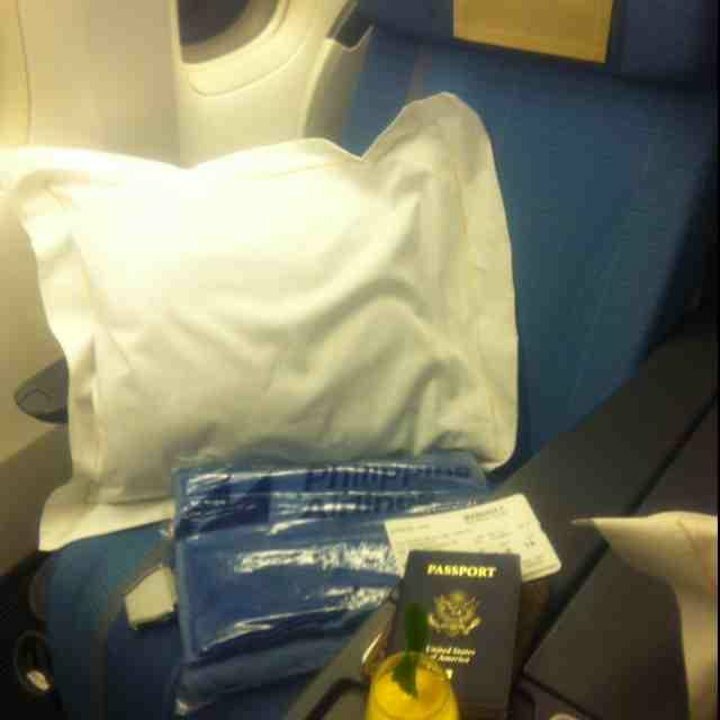 This review goes for trip from LAX to Manila and this one going from Manila to LAX both window seats. I don't recommend them due to not having an easy exit to walk the isles to stretch your legs or to have to frequent the restrooms without having to wake up bother the two people next to you, 13 to 15 hours confined in a corner up against a wall with a little window that most the time the flight crew would ask you to close felt claustrophobic and both times to Manila and back to LAX anxiety attack towards last 4 to 5 hours of flight before landing and out of respect i chose not to bother the other two passengers sitting next to me. Won't ever put myself in that position again rather have an isle seat so i'm free to move about, live and learn i guess it was my first time almost wanted it to be my last time due to the circumstances but the plane flight and the flight crew where Great therefore i will do it again just different seating arrangement for sure. I Love Philippine Airlines Great people!! This is an extra legroom exit row seat, which costs more than regular coach. Overall, this airline and this seat were a total disappointment. The airline packs as many people as they can in coach class, and the business class section looks more like economy plus, without lie flat seats. There is no full bar, and I had chicken adobo for dinner and for breakfast the next day. I had the "A" seat. Since I have broad shoulders, the curvature of the aircraft wall allowed no space for me to be comfortable. No sleep was had for 14 hours. The nearness of the lavatories made things even worse, including the smell. I will never fly Philippines again for long flights. Within Asia, it is probably adequate. Lack of storage at arms reach. Only storage are the bins above or in front but can't be used during takeoff and landing. TV screens are too far to read/see with or without glasses. The seats were very comfortable. The flight crew were excellent. Very friendly and accommodating (not the pilots - no interaction with them). I usually fly Delta Business class and their configuration is better for storaqe but the service provided by PAL's crew was far better than what Delta provides. This makes up for the shortcomings. Thank you PAL! Arm rest doest not go up on this row. I thought it was weird but my family sat on the same seats to and from manila and both times they did not go up. Asked the flight attendant and she said they do go up and so i asked her to to show me and then she couldnt. And just said " thats weird" and walked off. EXIT ROW 41A window exit seat wall close leg area is very cold due to strong air condition system coming out from the side of the exit door. you need to wear thick pants or else your leg will get cold cramp. 4H & 4K are great seats. I appreciated the convenience of being close to the restroom. Not noisy nor disruptive at all. Business class seating is totally worth every penny because of the legroom. Seats recline to a horizontal position although I prefer a little incline. It took me a few minutes to figure out the most comfortable sleeping position for me. Enjoyed having free movies available. The only thing I didn't like was the absence of A/C vents, so I had to fan myself because the temperature was too warm for me. Window view from this seat is excellent, especially if you'd like to appreciate the large wing area of the plane. Being on the wing itself, differences in acceleration during takeoff and landing were not jarring. This is based on personal preference. My mother and I traveled from LA to Manila with these seat assignments and yes the screen in fron is not that aligned but that's not much of a problem to us. My mom prefered the aisle seat since she frequents the lavatory more than I do and since this is the 4th to the last row, we were near the lavatories. We valued the comfort since there are only two of us in that row, and the left side (window) is spacious you can still put some things there. The wingrests for the head was a plus and I slept for 8 hours straight on a flight! We'll definitely book those seats again in our future flights. Seat 36K (and subsequently 36A) has a window shared with 37K (and 37A). One has to recline the seat to be able to look through the window. (In short, both window seats at row 36 can be classified as windowless). The outer aisle bulkhead seats 41C, 41H and 61C and 61H are just behind service areas and the aisles are displaced about 3/4+ of a seat out toward the side of the plane as they pass through those service areas. Thus when sitting in those seats you are essentially looking right into the aisle in front of you and you are therefore nearly totally exposed to people (and carts) moving to the back of the plane and so you are bumped and disturbed a lot. If you unfold your small video screen (from the armrest) it sticks even further into the path. You pay a premium for these seats and that is just stupid. Seat is not aligned with the seat in front of you so your in flight entertainment screen isn't directly facing you. The armrest would also block your tray so you won't be able to lay it out flat. The arm rest also has the retractable tray thay can lay out flat but is much smaller. USB power is also available in coach not just business class. Seat was standard. I did prefer only having two seats rather than three. Great Flight. Comfortable seat. Good service. Easy check-in. 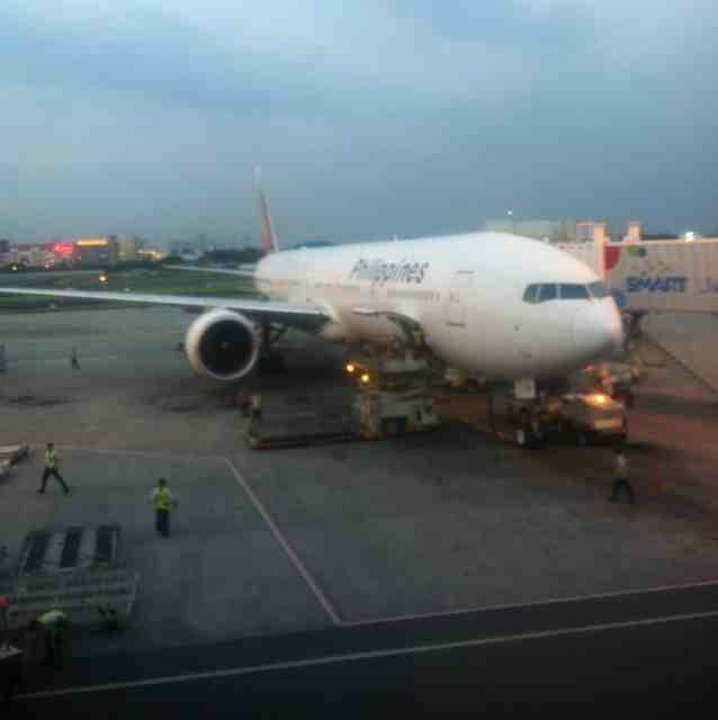 Philippine Airlines flies 1 versions of Boeing 777-300ER.